What is a "freezeout" tournament? 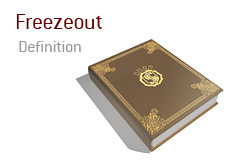 What is meant by the term "freezeout" as it applies to the game of poker? In poker, a "freezeout" is a tournament in which players are eliminated until there is just one player left with all of the chips. In addition, players are not allowed to re-buy or add-on - in a "freezeout", once a player is out of chips, they are eliminated from the tournament. The World Series of Poker main event is a great example of a (very big) freezeout. Thousands of players enter the main event, and the tournament eventually comes to a conclusion once one player possesses all of the chips. There are no re-buys or add-ons allowed in the World Series of Poker main event - once you are out of chips, you are officially eliminated from the tournament. "Freezeouts" can be as small as just two players or as big as a massive multi-table tournament. "Idol" Week Up Next on "Poker After Dark"